To all those on FB and Twitter who called me a racist for opposing the ANC’s fascist approach to satirical art and cynically whipping up racial tension for purposes related to the ANC elections race: You say you value personal dignity so highly, isn’t calling people like me and many others racists just because you disagree also an assault on dignity? God help us with a Minister of Higher Education like Blade Nzimande, the man in charge of our universities. He was spewing hatred and intolerance at the ANC’s march today and demanded that the state destroy the defaced Zuma Spear painting instead of allowing the new owner to take it home to Germany. 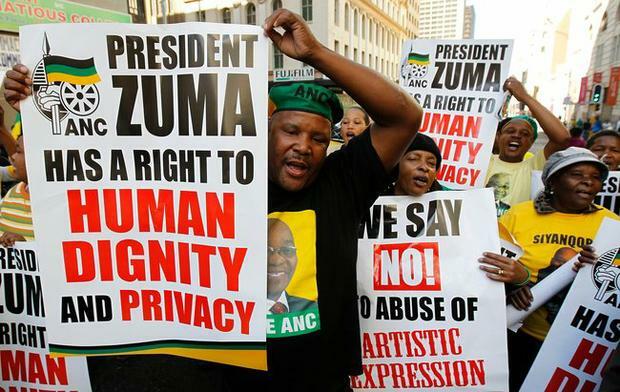 Watching the ANC march today I couldn’t help but think that the ‘amandlas’ and ‘vivas’ and ‘comrades’ and talk of ‘revolution’ have become so phoney and lame coming from the mouths of rightwingers like the Zuma faction of the ANC. City Press boosted its circulation figures, Ferial Haffejee is more famous than before and has become our first celebrity editor, the Goodman Gallery never need to advertise again. The only loser is the freedom of speech, the blood that keeps our democracy alive. I would still not trade living in SA here and now for anything. There is more to us as a nation than reckless politicians, hatred and intolerance. We must learn from this trauma and make our democracy stronger. I wish I could go for a week-long holiday on a boat in the middle of Lake Malawi with no cellphone, tv or internet.